How strategic is your corporate university? 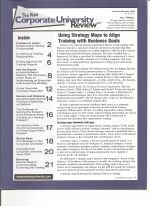 Center for Strategy & Leadership > Publications > Articles > How strategic is your corporate university? The New Corporate University Review, Vol. 6, No. 6, pp.18-19, 23. In recent years corporate universities have evolved rapidly on the United States and are emerging gradually in Western Europe and Asia. Not only have the number of such organizations increased considerably, they also developed in terms of quality. In this article we reflect on how far these institutions have come. Are corporate universities becoming the centers of new knowledge creation?